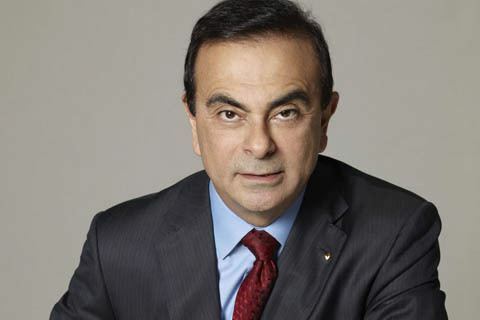 Carlos Ghosn, KBE (born March 9, 1954) is a Brazilian-Lebanese-French businessman born in Porto Velho, Brazil, who is currently the Chairman and CEO of France-based Renault, Chairman and former CEO of Japan-based Nissan, and Chairman of Mitsubishi Motors. From June 2013 to June 2016, Ghosn was Chairman of Russia-based automobile manufacturer AvtoVAZ. 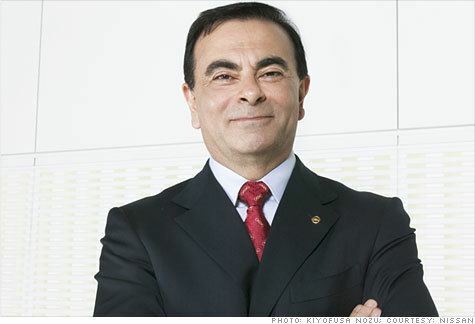 Ghosn is also Chairman and CEO of the Renault-Nissan Alliance, the strategic partnership overseeing Nissan and Renault through a unique cross-shareholding agreement. The Alliance, which includes AvtoVAZ and Mitsubishi, has held approximately 10% of the global market share since 2010, and as of 2017 is the third largest automobile group worldwide, having previously been the fourth largest automobile group worldwide since 2010. After his radical restructuring of Renault that returned the company to profitability in the late 1990s Ghosn became known as "Le Cost Killer". In the early 2000s, for orchestrating one of the auto industry's most aggressive downsizing campaigns and spearheading the turnaround of Nissan from its near bankruptcy in 1999, he earned the nickname "Mr. Fix It". Following the Nissan financial turnaround, in 2002 Fortune awarded him Asia Businessman of the Year. In 2003 Fortune identified him as one of the 10 most powerful people in business outside the U.S., and its Asian edition voted him Man of the Year. Surveys jointly published by the Financial Times and PricewaterhouseCoopers named him the fourth most respected business leader in 2003, and the third most respected business leader in 2004 and in 2005. He quickly achieved celebrity status in Japan and in the business world, and his life has been chronicled in a Japanese manga comic book. Ghosn has been asked to run at least two other automakers, General Motors and Ford. His decision to spend €4 billion (more than $5 billion) so Renault and Nissan could jointly develop an entire lineup of electric cars including the Nissan Leaf, billed as "the world's first affordable zero-emission car", is one of the four subjects of the 2011 documentary Revenge of the Electric Car. Ghosn stepped down as CEO of Nissan on April 1, 2017, while remaining Chairman of the company. Ghosn's grandfather Bichara Ghosn emigrated from Lebanon to Brazil at the age of 13, eventually settling in remote Guaporé, Rondônia, near the border between Brazil and Bolivia. Bichara Ghosn was an entrepreneur and eventually headed several companies, in fields including the rubber trade, the sale and purchase of agricultural products, and aviation. His son Jorge Ghosn married a Nigerian-born woman whose family also came from Lebanon, and they settled in Porto Velho, the state capital of Rondônia. 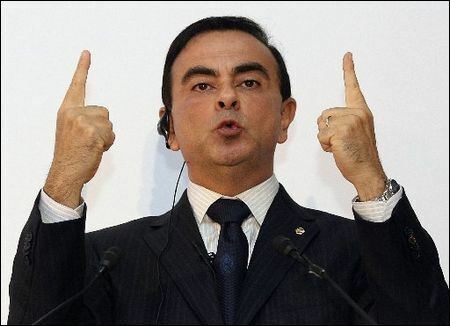 Carlos Ghosn was born on March 9, 1954 in Porto Velho. When he was about two years old he became sick after drinking unsanitary water, and his mother moved with him to Rio de Janeiro. He did not fully recover there, and in 1960, when Ghosn was six years old, he and his mother and sister moved to Beirut, Lebanon, where his grandmother lived. Ghosn completed his secondary school studies in Lebanon, at the Jesuit school Collège Notre-Dame de Jamhour. He then completed his classes préparatoires in Paris, at the Collège Stanislas and the Lycée Saint-Louis. He graduated with university engineering degrees from the École Polytechnique in 1974 and the École des Mines de Paris in 1978. In 1985, when Ghosn was 30 years old, he was appointed Chief Operating Officer (COO) of Michelin’s South American operations. He returned to Rio de Janeiro, reporting directly to François Michelin, who tasked Ghosn with turning around the operation, which was unprofitable and struggling under Brazil's hyperinflation. Ghosn formed cross-functional management teams to determine best practices among the French, Brazilian, and other nationalities working in the South American division. The multicultural experience in Brazil formed the basis of his cross-cultural management style and emphasis on diversity as a core business asset. "You learn from diversity ... but you're comforted by commonality", Ghosn has said. The division returned to profitability in two years. After turning around Michelin's South American operations, Ghosn was appointed President and COO of Michelin North America in 1989, and moved to Greenville, South Carolina with his family. He was promoted to CEO of Michelin North America in 1990. He presided over the restructuring of the company after its acquisition of the Uniroyal Goodrich Tire Company. In 1996, the ailing French auto manufacturer Renault recruited Ghosn as Executive Vice President in charge of purchasing, advanced research, engineering and development, powertrain operations, and manufacturing; and he was also in charge of Renault’s South American division, located in the Mercosur. Ghosn's radical restructuring of Renault successfully returned the company to profitability in 1997. In March 1999, Renault and Nissan formed the Renault-Nissan Alliance, and in May 1999 Renault purchased a 36.8% stake in Nissan. 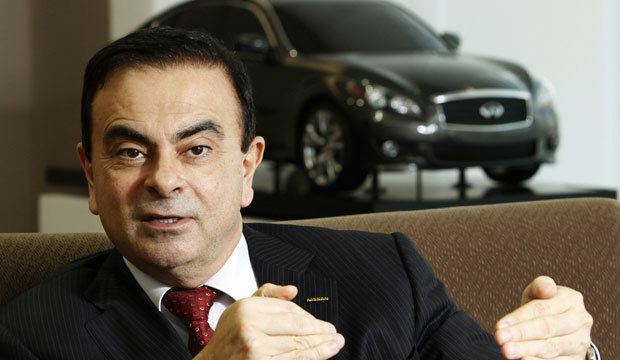 While maintaining his roles at Renault, Ghosn joined Nissan as its Chief Operating Officer (COO) in June 1999, became its President in June 2000, and was named Chief Executive Officer (CEO) in June 2001. When he joined the company, Nissan had a consolidated interest-bearing net automotive debt of more than $20 billion (more than 2 trillion yen), and only three of its 46 models sold in Japan were generating a profit. Reversing the company's sinking fortunes was considered nearly impossible. In May 2002 Ghosn announced his next set of goals for the company, "Nissan 180", a three-year plan for growth based on the numbers 1, 8, and 0: By the end of September 2005 Nissan planned to increase its global sales by one million vehicles; and by the spring of 2005 it was committed to achieving an operating margin of at least 8% and reducing its net automotive debt to zero. These goals were all reached: In the spring of 2003 Nissan announced that its net automotive debt was eliminated in fiscal year 2002. Nissan's operating profit margin climbed to 11.1% in fiscal year 2003; it had been 1.4% in fiscal year 1999. In October 2005 Nissan announced that its annual sales from September 30, 2004 to September 30, 2005 were more than 3.67 million, up from the 2.6 million vehicles sold in the fiscal year ended March 2002. In 2007, Ghosn led the Renault-Nissan Alliance into the mass-market zero-emission electric car market in a major way, and committed €4 billion (more than $5 billion) to the effort. In 2008 he confirmed that Nissan-Renault would bring an "entire lineup" of zero-emission electric cars to the worldwide market by 2012. In 2009, he told the University of Pennsylvania's Wharton School of Business, "If you're going to let developing countries have as many cars as they want—and they're going to have as many cars as they want one way or another—there is no absolutely alternative but to go for zero emissions. And the only zero-emissions vehicle available today is electric.... So we decided to go for it." The Nissan Leaf, an electric car billed as "the world's first affordable zero-emission car", debuted in December 2010. As of 2017, the Renault-Nissan Alliance is the world's electric vehicle leader, selling more than double the number of electric cars as Tesla, and the Nissan Leaf is the world's best-selling electric vehicle by a wide margin. In 2008, Ghosn was named Chairman, President, and CEO of Nissan. In 2009 he was named Chairman and CEO of Renault. Ghosn was a visible leader in recovery efforts after the Japanese earthquake and tsunami on March 11, 2011, one of the worst natural disasters in modern history. On March 29, 2011, he made the first of several visits to the hard-hit Iwaki engine plant in Fukushima prefecture, 50 km (31 miles) from the Fukushima Daiichi nuclear power plant, and at his direction Nissan restored full operations at the Iwaki factory well ahead of expectations. He appeared on television in Japan to encourage optimism. In May 2011 Ghosn remained committed to building at least 1 million of Nissan's cars and trucks in Japan annually. In June 2012, Ghosn was named Deputy Chairman of the Board of Directors of Russian automobile manufacturer AvtoVAZ. In June 2013 he was appointed Chairman of the Russian company, a position he retained through June 2016. Renault had begun a strategic partnership with AvtoVAZ in 2008 by acquiring a 25% stake in the company; this led to increasingly deeper partnerships between Renault-Nissan and AvtoVAZ, ending in Renault-Nissan Alliance control of the Russian automaker in 2014. In February 2017 Ghosn announced he would step down as CEO of Nissan on April 1, 2017, while remaining chairman of the company. Hiroto Saikawa, who had been at Nissan 40 years and was co-chief executive of the company, became its CEO. In October 2016, Nissan completed the acquisition of a controlling 34% stake in Mitsubishi Motors. 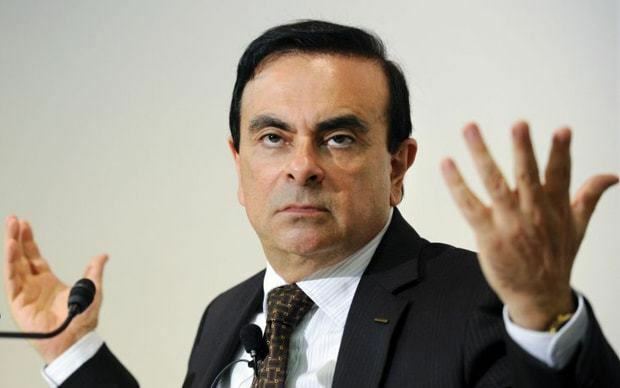 Ghosn became, in addition to his Renault-Nissan posts, Chairman of Mitsubishi, with an aim to rehabilitate the automaker after a months-long scandal involving fuel-economy misrepresentation and consequent falling revenues. The Nissan-Mitsubishi partnership includes partnership in developing electric automobiles for Mitsubishi, and the Renault-Nissan-Mitsubishi alliance creates the world’s fourth-largest auto group, after Toyota, Volkswagen AG, and General Motors Co.
Ghosn served on the International Advisory Board of Brazilian bank Banco Itaú until 2015. He is also a member of the Advisory Board of Tsinghua University School of Economics and Management in Beijing. He has received an honorary doctorate from American University of Beirut; and he is a member of the Strategic Council, Saint Joseph University of Beirut. In 2014 and 2015, he was elected president of the European Automobile Manufacturers Association. He serves as Governor of the World Economic Forum. Ghosn is multilingual and speaks four languages fluently: French, Portuguese, English, and Arabic, and he has also studied Japanese. He also maintains ties to Lebanon, where he lived for 10 years and where he completed his primary and secondary education. He is a partner in Ixsir, a winery in the northern coastal town of Batroun, Lebanon. In 2012 he was named to the Honorary Board of the American Foundation of Saint George Hospital in Beirut. Ghosn has been hailed as a potential presidential candidate in Lebanon. In a June 2011 survey by life-insurance company AXA, Ghosn was ranked No. 7 in a random poll asking Japanese people, "Which celebrity do you want to run Japan?" (Barack Obama was No. 9, and Prime Minister Naoto Kan was No. 19.) He has so far declined such overtures, saying he has "no political ambitions". Ghosn is the divorced father of four grown children. He has residences in France, Japan, and Brazil. Ghosn's quest to develop Nissan's line of zero-emission electric cars is one of the four subjects of the 2011 documentary Revenge of the Electric Car. The zero-emission Nissan Leaf, which Nissan began delivering in late 2010 in the United States and Japan, is the world's first mass-produced zero-emission electric vehicle. Ghosn authorized more than $5 billion to bring the Leaf, and numerous derivative electric cars based on the Leaf's architecture, to market—a gamble that prompted BusinessWeek to ask whether he was "crazy". Ghosn is a frequent subject of university thesis papers and essays among business students. CyberEssays has a section dedicated to papers about Ghosn's corporate leadership. One of the more commonly cited thesis papers is the June 2005 MBA thesis written by Koji Nakae of the MIT Sloan School of Management, which compares Ghosn to U.S. General Douglas MacArthur, who restructured Japanese society after World War II.